In 1965, at the age of 69, on the order of his spiritual master Srila Bhaktisiddhanta Saraswati Thakura, representing a line of teachers dating back to Lord Krishna Himself, Srila Prabhupada sailed from India to New York to share Lord Krishna's message. He brought with him a trunk of books, $7 in change, and the firm faith that the holy name of Krishna would transform the hearts of people he would meet. In the years that followed, he founded the International Society for Krishna Consciousness (ISKCON), traveled and taught throughout the world, opened more than 100 temples and inspired thousands of devotees. He wrote over forty volumes of translation and commentary on such classics as Srimad-Bhagavatam (Bhagavata Purana), Chaitanya-charitamrita, and Bhagavad-gita. He wrote not only as a scholar but as a consummate practitioner, teaching by the example of his life. 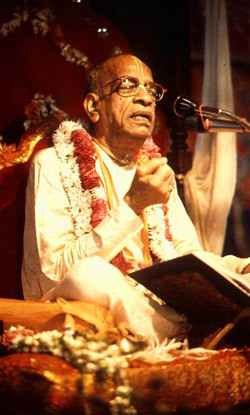 Throughout his works, Srila Prabhupada's mood was to convey the natural meaning of the scriptures without far-fetched interpretations, giving us an authentic rendition of the Vedic conclusions on such important topics as the purpose of human life, the nature of the soul, consciousness, and God. 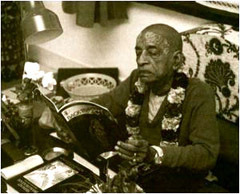 Srila Prabhupada Shop, his biography, videos, lectures and music. Srila Prabhupada's books: Srimad-Bhagavatam, Caitanya-caritamrita, Bhagavad-gita As It Is, and other books. Homages to Srila Prabhupada written for his annual Vyasa-puja celebrations. Srila Prabhupada describes and differentiates between the personal and impersonal aspects of Sri Krishna and of the spirit soul. Srila Prabhupada encourages us (over the shouts of a nearby martial arts school) to make the best use of our valuable human life. In this video excerpt, Srila Prabhupada describes the differences between current and past governments. In this video, Srila Prabhupada describes how human intelligence can be used properly. Srila Prabhupada challenges popular assumptions about "gurus," and explains the position of a bonafide spiritual master. A.C. stands for Abhay Charanaravinda, the name given to him at initiation by his spiritual master. It means "one who is fearless, having taken shelter at the lotus feet of Krishna." The title Bhaktivedanta was awarded to him later to denote his devotion (bhakti) and his deep understanding of the conclusion of spiritual knowledge (vedanta). He received the title Swami (which means “controller of the senses”) in 1959 when he accepted the traditional renounced order of sannyasa. For brevity, scholars sometimes refer to him as Bhaktivedanta Swami, and both scholars and devotees refer to him as Srila Prabhupada, the term Srila being an honorific title that means "eminent." Pronunciation: Bh is pronounced like the b in English but with an extra puff of breath. Bhuck-tee-vay-DAHN-ta … Prah-bhoo-PAHD.